Last Saturday I got a new (to me) car!! I love it. 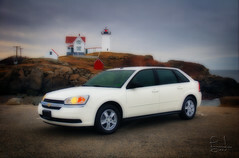 The 2004 Malibu Maxx has loads of space, remote start, multi-disc stereo with auto-volume control and an impressive onboard computer. Very nice! Congrats. By impressive computer do you mean it doesn’t run Windows? I guess the cargo area will end up all scratched up like mine after you’ve had the light stands in and out a few dozen times.